Always remember SAFETY first! Be sure your vessel is securely moored to the fuel dock, shut off the engine, turn off all electronic equipment and heat sources, and send all other passengers ashore. Close all hatches, doors and ports. Extinguish all burning tobacco and make sure no one is on board before fueling. Make sure your fire extinguisher is within reach. Know how much fuel your boat holds and how much you need. Inquire about what the flow rate is for the fuel source you are utilizing. This information, coupled with your knowledge of your boat tank capacity and tank fuel level, will assist you to have a better understanding of how long the fuel nozzle should be on. Make sure you fill up the tank with the right type of fuel and check that the fuel is going into the proper fill entry. Make sure you check with the marina or fuel dock staff about their fueling policies. If you have any questions regarding how to properly fuel your boat, contact your marina or fuel dock operator. While fueling, make sure the fuel nozzle is in contact with the metallic fuel tube or pipe to prevent static sparks. Attend the fuel nozzle at all times. Always use an oil absorbent, fuel donut or fuel bib around the deck filler (available at some marinas and marine supply stores) to catch spills and overflow. Be sure to properly dispose of fuel-soaked absorbents as hazardous waste. Use a properly vented fuel spill container to cover the air vent and catch spills and overflows from the vent and prevent them from reaching the surface of the water. Consider installing a fuel spill prevention device, such as a fuel/air separator or whistle in the vent line, to prevent overfilling. Fill tank slowly and listen for a change in tone as the tank gets full. Do not rely on the automatic shut-off nozzle to prevent spills; they often do not shut off in time. Fuel the boat at the start of trips and only to 90% of tank capacity. Remember fuel expands as it heats. If you leave your boat with a full tank on the water your boat may vent fuel overboard. Never turn on the switch for fuel gauge (or any switch) while refueling. Turning on any electronics while fueling is dangerous and can increase the risk of sparking. 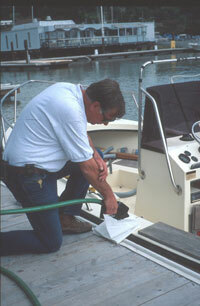 Clean any drops off the nozzle and boat deck with an absorbent. And for gasoline systems, before starting the engine, open hatches, doors and ports to ventilate and operate the blower for 3-5 minutes. 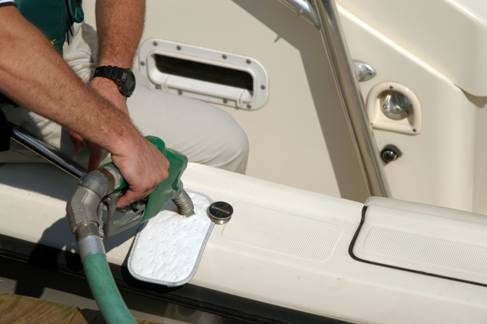 Check bilge and engine compartment for fuel odors and make sure there is no odor of gasoline anywhere in the boat. The same rules apply when fueling a personal watercraft in the water. At the end of the season or during long periods of inactivity, leave the tank full to reduce corrosion and condensation. Add fuel stabilizer to prevent stale gas. Always fill portable tanks ashore where spills are less likely to occur and easier to clean up. Portable tanks should be on the ground when filled- to prevent risk of static sparks, never fill plastic portable tanks with tanks in the back of a truck with a non-metallic bed liner Use funnels to fill portable tanks, or spill-proof portable containers, and keep oil-only absorbents on hand to catch spills. .
Report ALL spills of oil and chemicals immediately to the National Response Center (800) 424-8802, California Office of Emergency Servicess (800) OILS911 and to the marina office. Learn more about environmental laws associated with fuel and oil.